Skateboard fans will witness the Vans BOWL-A-RAMA™ 2013 series kick off in Wellington from February 13; closely followed by Vans BOWL-A-RAMA™ Bondi beginning February 19, the world’s best skateboarders will be coming together to battle it out for both titles. Wellington’s Waitangi Park will play host to Vans BOWL-A-RAMA™ Wellington, from February 13 – 17, 2013, the biggest week of skateboarding infused cultural festivities in New Zealand. Vans BOWL-A-RAMA Wellington attracts legendary international Pro and Master skateboarders who compete alongside some of New Zealand’s finest concrete Warriors. 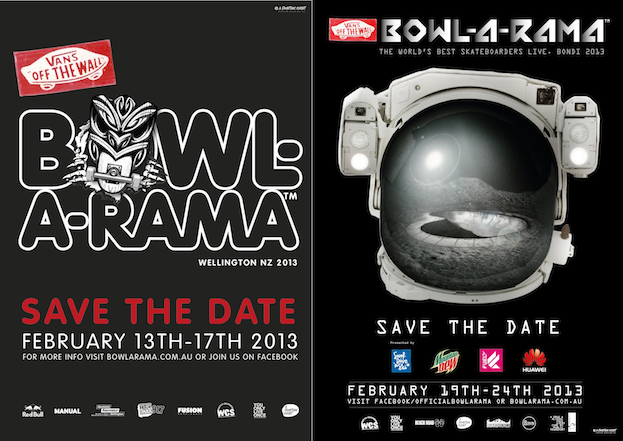 2013 will mark the sixth year of Vans BOWL-A-RAMA™ in Wellington, with the final held Saturday, February 16. Crowds will witness the most impressive line up of skate talent battle it out for an overall $30,000 prize purse. Vans BOWL-A-RAMA™ Bondi hits the shores of Bondi Beach from February 19 – 24, 2013; with Sydney the second stop of the 2013 circuit. In its ninth year, Vans BOWL-A-RAMA Bondi boasts a four day line up of skateboarding infused cultural activities with competition taking place Saturday February 23. Bondi crowds will witness the most impressive line up of skate talent, with both the Pros and Masters division competing for an overall prize purse of $100,000. The biggest prize purse in the competition’s history. Vans BOWL-A-RAMA™ was born on Bondi Beach, Sydney (Australia) in 2005 and is the biggest professional concrete skateboard series in the world. With the addition of NYC in 2012, BOWL-A-RAMA now calls some of the world’s most iconic destinations home. Both Vans BOWL-A-RAMA™ Wellington and Vans BOWL-A-RAMA™ Bondi are set amidst a week of festivities dedicated to celebrating art, music and true skateboard culture. The Vans BOWL-A-RAMA 2013 series follows the debut of Vans BOWL-A-RAMA in NYC’s Hudson River Skatepark in 2012.